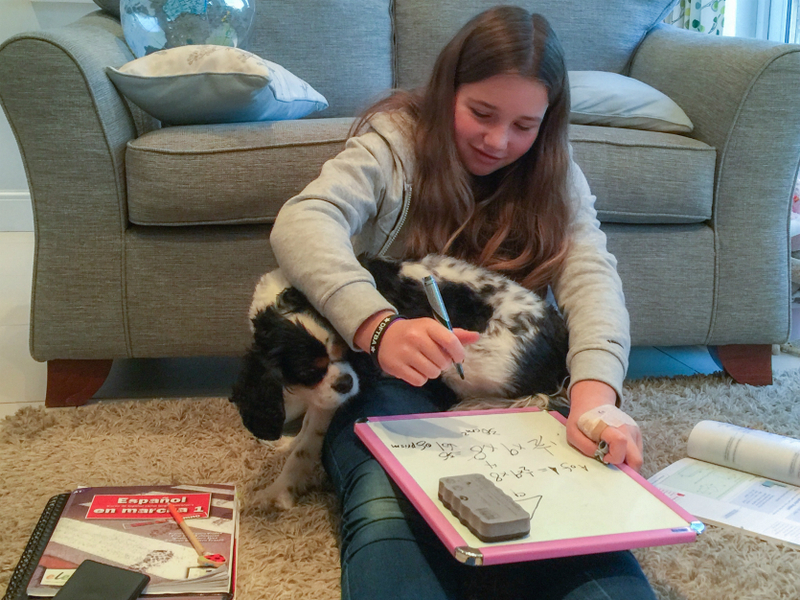 What’s it like Homeschooling an 11 and 12 Year Old? Have you ever wondered why there are so few blogs about homeschooling older children? I used to. Then my kids became tweens. We’re still unschoolers, but the hands-on activities that used to make up our day are gradually being replaced by independent projects, reading and outside classes. 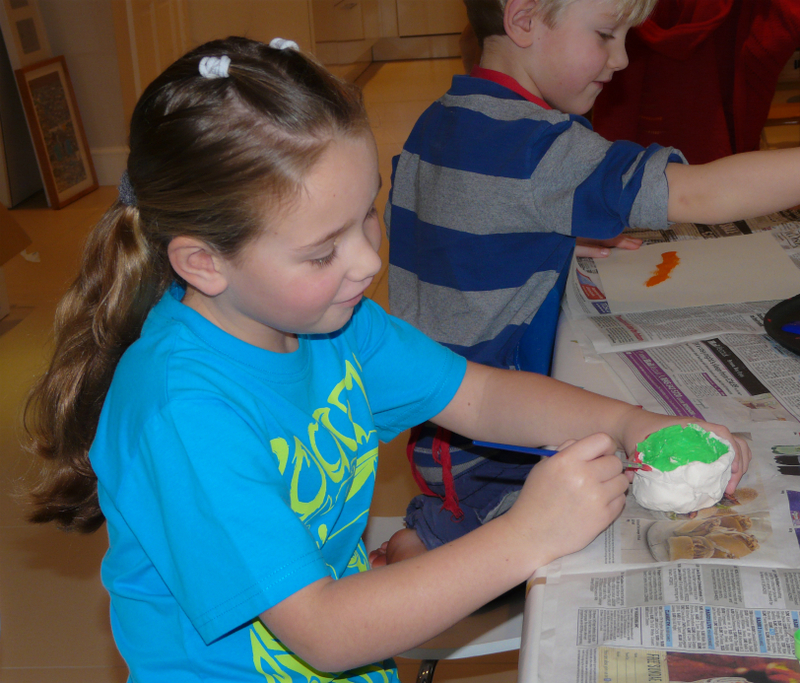 And photos of tweens reading, watching YouTube or even quietly crafting aren’t quite the same as cute pics of little ones doing colourful science experiments and messy art projects. Our homeschooling is just as much fun, but these days the enjoyment lies more in the conversations we have, the puzzles we ponder and the jokes we share. Back in the anxious, early days when we started homeschooling I used to wonder how I’d cope with the pressure when my kids reached senior-school age (11, here in the UK). But now with one child near the end of her first senior-school year and the other just turned 11, I feel calmer and more confident than ever. One of the reasons I feel so relaxed is that having spent the last six years alongside my children, I know them pretty well. I know how they learn, what interests them, what their quirks are and what inspires them. Of course Cordie and Jasper are still changing – now more than ever, perhaps – but thanks to our time together I have a much better understanding of who they are and how I can support them. Time’s also given me perspective. Over each year that I’ve watched these two young people blossom, my faith in unschooling and in their ability to learn what they need grows stronger. As homeschoolers we’ve always forged our own path. Whenever I’ve had a wobble and tried to steer us in a more schooly direction, my kids have made it clear they were having none of it. Like when they refused to follow any maths curriculum – which led us down the living maths route, something I’m truly appreciative of (at least in hindsight!). Now we’re looking ahead to the teen years and exams, I’m so thankful for how we’ve done things. All those ‘random’ science experiments really did both spark an interest in science and give my kids a solid grounding in chemistry and physics. Living maths prepared them better than I could even have imagined for taking on trigonometry, algebra and geometry. The poetry teatimes, read-alouds and audiobooks nurtured a deep love of literature. And I recently realised that the reason it’s taken us five years to read three volumes of The Story of the World is because these days I can barely read a sentence without stimulating an intense debate about how such-and-such leader is repeating the mistakes of so-and-so who came before him, or how the Napoleonic Empire relates to the UK’s forthcoming referendum on whether to stay in Europe! Last year was a huge turning point for me. I discovered that my son is twice-exceptional and that both my kids and I have the innate personality traits known as overexcitabilities, which explains why we’ve always found ourselves at the fringes of homeschooling communities. After years of feeling isolated I found my tribe and launched a new blog to help others find theirs, too. Now, equipped with even better information about who my children are and how I can support their learning, I’m looking forward to the next stage of our us-schooling adventure. Launching Laugh, Love, Learn has taken most of my blogging energy so far this year, but now it’s up and running I’d like to check back in here more regularly. I’m so appreciative of the bloggers who continue to write about their teens’ learning. I may not be as creative and organised as my friends Sue and Claire but if I can even inspire one person to trust their instincts and keep on home-educating their kids in the way that feels right to them, it will be worth it! I’m appreciatively linking up at Weird Unsocialized Homeschoolers’ Weekly Wrap-Up and The Squishable Baby’s Homeschool LinkUp. While I’m loving your new blog and often feel like you’re writing about us, I must say I’m ever so happy to see that this one will keep rolling along also. I’m looking forward to reading about unschooling in the teen years and I love knowing the resources you provide for your children. Some of our most successful activities and resources have been sourced from this blog! Are you on the Well Trained Mind forums? There’s a social group for unschool-ish homeschoolers and there’s discussion on there right now about how unschooling looks in the highschool years. This is clearly something quite a few of us are thinking about right now. Hi, I was a bit nervous posting over here after such a long absence, so it was really nice to get your lovely comment so soon – thank you! So many things can stop me blogging (imaginary worries my OE mind dreams up, like ‘are we really unschoolers?’ or ‘what if everyone unsubscribes if I don’t post elaborate science experiments?’ ;-)) but I know how much I enjoy other people’s blogs so I decided not to let my anxieties stop me. I haven’t visited the Well Trained Mind forums for a long time – I think I decided years ago that we weren’t ‘classical’ enough to be allowed there. But a conversation about unschooling high-schoolers sounds right up my street so I shall head over and check it out. Thank you! To be honest, I have no idea what ‘Classical’ education is meant to be and I’ve never even read The Well-Trained Mind book/s. But I find the forums to be full of a huge range of styles and there’s a lot of interesting discussion about challenges, resources, ideas etc. I usually hang out on the Accelerated Learners board and it is full of incredibly supportive people who all just genuinely want the best for their child’s home education. I’ve gained an awful lot from the folks on there. I enjoyed looking through the posts of your new blog. It is harder to blog the projects as they get older.i always enjoy every post you write. I have noticed that as my oldest son is turning 12 a lot of my blog now focuses on the younger two and for many of the reasons you list.. pictures of him trucking along at his own pace are not all that exciting and since he really enjoys workbooks that’s even less so! But I do enjoy reading blogs of other middle schoolers because they do encourage me to keep on doing what we’re doing. I completely agree with you! I post a lot of pictures from hikes and vacations because our daily life just doesn’t seem that exciting! LOL! I also want to respect their privacy as they get older. I do hope you continue on your blog. I do enjoy reading (even if it is snippits) about other unschoolers. I am heading over to your new blog now! Hi Sharon, Yes, vacation photos are always good, aren’t they? 🙂 And I agree, it’s great to read snippets from other unschoolers’ lives. I love remembering how diverse all our kids’ journeys are, and being inspired to try new activities or resources. Thank you for looking at my other blog – I appreciate your support! Your new post popping up in my inbox made me smile! You have been an encouragement to me in our us-schooling journey! I look forward to reading more about your living math adventure…we are in that journey too. Love to see that everything is still working for you. Have you ever posted about what sort of activities you did for living math? Thanks, Shelly – it’s lovely to hear from you. 🙂 I posted lots about our maths-without-a-curriculum. I need to organise the posts into a page, but for now you can find them under the Living Maths category. Do you do living maths? I try to incorporate it in whenever I can, but we do also use Life of Fred. Somehow I don’t think I realized your new blog was over there, popping over to add it to my feed reader. I so agree, posts of kids diligently writing in notebooking pages are just not as exciting as the other stuff. Of course my kids still crave the hands on material but they don’t need the cutesy stuff, so I’m trying to find a balance. Thanks, Ticia. 🙂 Good to see your guys are still into the hands-on stuff too. Jasper still wants hands-on science thankfully so I still get to have some fun. I’m really glad you dedicated so much time on your other blog as you helped spread the word about OE and PowerWood with your magical writing skills, but I really appreciate that you have picked up this blog as well as that’s very inspirational too. I wish that when we started home-educating our children (who are now young adults) I could have read your blogs, that would have helped immensely, not only content wise but also feeling part of a group:)! Hello Wendy, Thank you so much for stopping by, for reading my posts and for your kind words. Thanks, too, for taking the time to let me know what you’d be interested in reading more about. I appreciate it! I’m just finishing a post about maths which I’ll publish soon. I’m wondering, are you also one of Sue Elvis’s friends?